We'll get to the new claims shortly, but first, here's Moore's attempted defense: His attorneys held a presser last evening, during which they demanded access to Beverly Young's yearbook, which she says he asked to sign for her in 1977. He says they've never met and that he's never been to the restaurant where the alleged interactions -- including an alleged assault -- took place. (Despite the reckless and false claims of Moore's wife, the restaurant in question was in operation at the time). They contend the inscription signature is fishy, and that the responsible party likely pulled his signature from a specific court document. Problem: Those two signatures don't look alike, as the yearbook signature doesn't contain his middle initial 'S,' which features prominently on the court document version. As I say in the tweet, I'd also love for him to explicitly define what he means by "underage girls" at the end of the missive. More importantly, as others noted, at no point during the attorney's media event did they address specific allegations about his sexual misconduct, nor did they address the Washington Post story in which four women went on the record describing his sexual and romantic overtures toward them while they were high school students. This was a PR effort to demand the release of a decades-old yearbook in order to allow a handwriting expert to examine it. For what it's worth, if the expert (or experts) are independent, mutually-selected, and well-regarded, I think that's a reasonable request. The woman's lawyer, Gloria Allred, says they'd only release the book as a part of Senate hearings. That's theatrical and evasive. A Gadsden woman says Roy Moore groped her while she was in his law office on legal business with her mother in 1991. Moore was married at that time...In interviews with AL.com, Tina Johnson recalls that in the fall of 1991 she sat in the law office of then-attorney Roy Moore on Third Street in Gadsden. Her mother, Mary Katherine Cofield, sat in the chair next to her. Moore sat behind his desk, across from them. Johnson remembers she was wearing a black and white dress. Almost from the moment she walked in to Moore's office, Johnson said, Moore began flirting with her. "He kept commenting on my looks, telling me how pretty I was, how nice I looked," recalled Johnson. "He was saying that my eyes were beautiful." It made her uncomfortable. "I was thinking, can we hurry up and get out of here?" Johnson was 28 years old, in a difficult marriage headed toward divorce, and unemployed. She was at the office to sign over custody of her 12-year-old son to her mother, with whom he'd been living...At one point during the meeting, she said, Moore came around the desk and sat on the front of it, just inches from her. He was so close, she said, she could smell his breath. According to Johnson, he asked questions about her young daughters, including what color eyes they had and if they were as pretty as she was. She said that made her feel uncomfortable, too. Once the papers were signed, she and her mother got up to leave. After her mother walked through the door first, she said, Moore came up behind her. It was at that point, she recalled, he grabbed her buttocks. Court documents confirm the meeting, and her sister says she told her about the episode at the time. In 1991, Moore would have been in his late 40's and married. She was more than 15 years his junior, which fits the pattern. Why is this woman just coming forward now? Johnson, who is now disabled, considers herself a devout Christian and regularly attends a church near her home in Gadsden. She said she is not political and doesn't follow politics. She said she has not spoken with Moore since that day in his office, and does not know any of the five other women who have come forward with accusations against him. "This is not a politics thing with me," she said. "It's more of a moral and religious thing." It has bothered her over the years to see Moore on TV, talking about his Christian faith. She wanted to come forward publicly now, she said, because it's hard for victims of harassment to talk openly about their experiences. 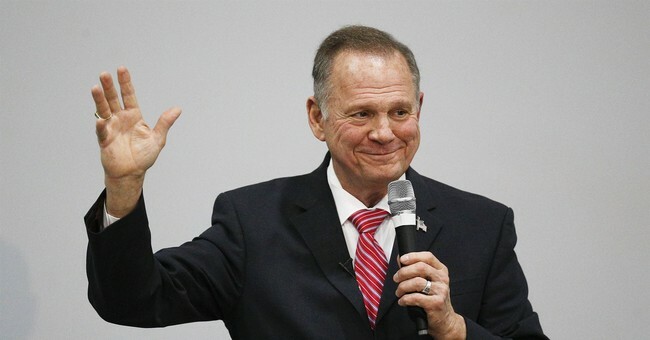 Moore, then a 30-year-old local attorney, was gaining a reputation for pursuing young women at the mall in Gadsden, Ala. His overtures caused one store manager to tell new hires to “watch out for this guy,” another young woman to complain to her supervisor and Richardson to eventually hide from him when he came in Sears, the women say. Richardson says Moore — now a candidate for U.S. Senate — asked her where she went to school, and then for her phone number, which she says she declined to give, telling him that her father, a Southern Baptist preacher, would never approve. A few days later, she says, she was in trigonometry class at Gadsden High when she was summoned to the principal’s office over the intercom in her classroom. She had a phone call.“I said ‘Hello?’” Richardson recalls. “And the male on the other line said, ‘Gena, this is Roy Moore.’ I was like, ‘What? !’ He said, ‘What are you doing?’ I said, ‘I’m in trig class.’"
"I'm in trig class." Yes, I'm sure this is all just a giant conspiracy against an innocent man. State Republican officials met last night to discuss their options, which look pretty limited at this point. One internal poll leaked yesterday showing Moore down 12, but I suspect that's a 'shock poll' designed to push him out of the race. I can buy that the contest is uncomfortably close (remember, Moore is running against an abortion extremist leftist who'd otherwise have zero chance of winning). I'm not sure I buy that the Republican is trailing by double digits in Alabama. Parting thought: Is this a viable Hail Mary? Based on my reporting, it looks like one of the only *real* chances of knocking Moore off the ballot is for Strange to resign right now and for Ivey to then appoint a successor, which scraps the election until standard ballot in 2018.